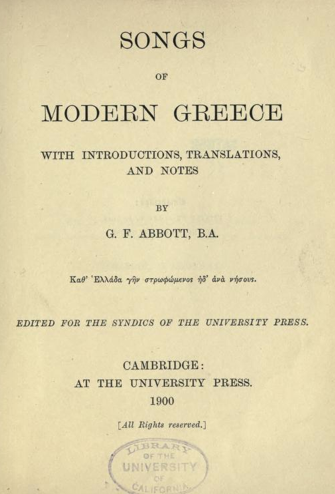 "In preparing this edition of modern Greek songs my object has been to produce a work of interest both to the lover of folk-lore in general, and to the classical scholar in particular. I have aboided, to the best of my knowledge, including any poems previously published in Western Europe, and this limitation has naturally compelled me to reject pieces often of equal and sometimes of superior merit to any contained in the present collection. 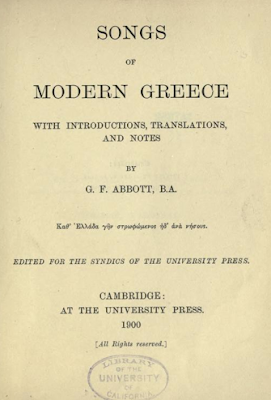 On the other hand, I have endeavoured by adding an elaborate commentary to render the collection, such as it is, more useful than a mere compilation. . . "